“My friends! You have come to see an innocent man die. I die for having killed an assassin. He attempted to rob me; I resisted; he stabbed me and fled. Maddened and smarting from my wounds, I pursued, overtook, and killed him. I am a native of Valencia, Spain. I have but few friends in San Francisco. 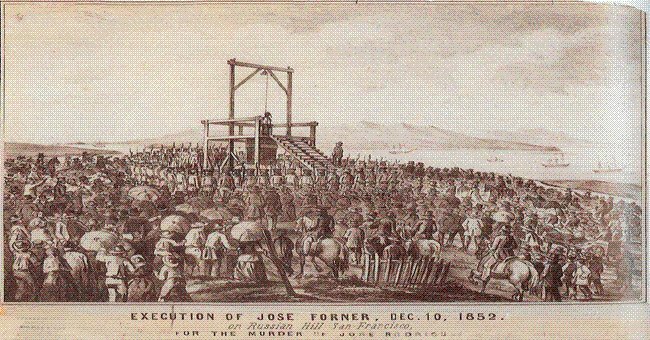 Having so declaimed, Jose Forni (or Forner) dropped through a trap on San Francisco’s Russian Hill and into the history books as the first hanging under color of law in the state of California. 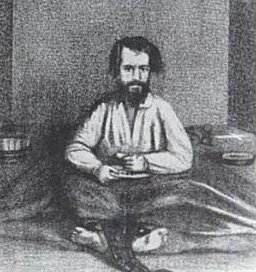 Forni was pretty small potatoes for such a milestone, a Spanish immigrant caught stabbing to death a Mexican in broad daylight a mere three months before. Despite Forni’s mysterious last statement, everyone was in fact pretty sure they knew what led to the killing. Forni stuck to the story that it was his, and that Rodriguez had tried to jump him and take it when Forni set the sash down to relieve himself. And that then, after he’d been stabbed in the leg, he chased down the assailant. If this doesn’t seem like the sort of thing hippy-dippy San Francisco would ordinarily strut about, bear in mind that the previous year, a standing Committee of Vigilance had formed itself and meted out extrajudicial lynchings without waiting on “the quibbles of the law, the insecurity of prisons, the carelessness or corruption of the police, or a laxity of those who pretend to administer justice.” Similar committees operated elsewhere in the state. So the fact that Forni was suffered to wait on the quibbles of the law was a sort of progress. And it does sound, from the report in the next week’s (December 16) Alta California, as if the populace were jolly pleased to see it. A continuous line of human beings was pressing up the hill all the morning, until a crowd numbering three thousand at least had gathered together [n.b. – nearly a tenth of San Francisco’s population at this time -ed.] … the assemblage was indeed a singular one — there being at least one-fourth of the number composed of youths, women and children. 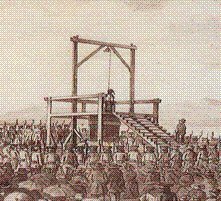 Women elbowed their way as near as possible to have a full view of the gallows, whilst others were on horseback and in carriages, riding around with as much gaiety as if on a pleasure drive. But what was most shocking was to see respectable looking parents taking their little sons and daughters into such a heterogenous crowd, to witness such a terrible spectacle. Despite the slight rain, they stood it out with heroical fortitude and patience worthy of a better occasion. Before the prisoner had arrived, the small boys amused themselves with playing marbles, the bigger ones with dog fights, whilst others whiled away the time recounting their experience in such matters.